I’ve run out of Thursdays to post my Recommended Reading, but I’ve read a couple more books recently that I didn’t want to leave unwritten-about when the calendar flips to 2014. 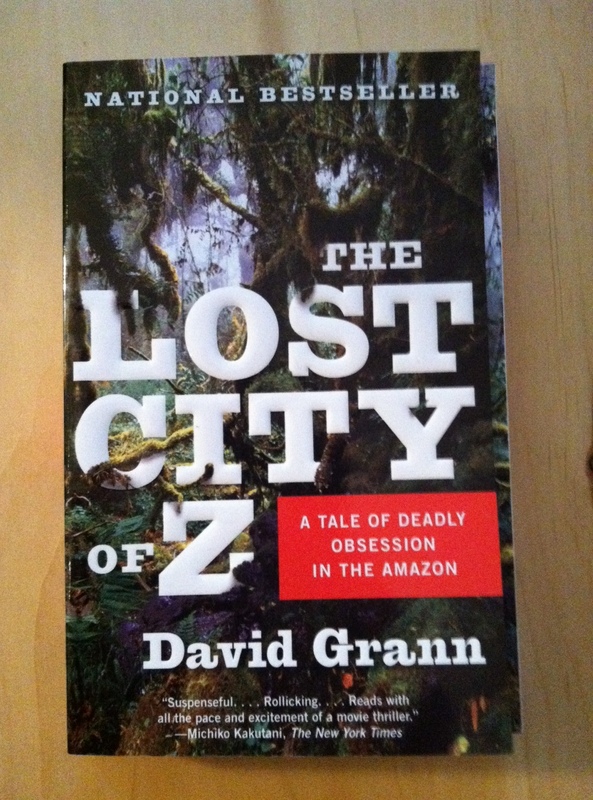 The first is David Grann’s 2009 bestseller The Lost City of Z, a nonfiction account of Mr. Grann’s attempt to trace the story of legendary explorer Percy Fawcett’s disappearance into the Amazon in 1925. I bought the book for my husband a couple years ago, and I’ve been eyeing it ever since. You’ve probably noticed that my reading habits tend toward fiction and poetry, but I do try to live up to my “Omnivorous Reader” tagline by dabbling in YA, nonfiction, and even, once, romance (shudder). And I’m very glad this is so, because The Lost City of Z was a great read. Now, generally I don’t go in for books about adventurers and extreme sports, because I just can’t get over the “why the hell would you leave your family to perform some completely unnecessary feat of strength and possibly endanger people who are required to rescue you?” reaction. All those books about people who climb Everest drive me CRAZY. Don’t get me started on skydiving. Want a physical challenge and have money and/or time to burn? Volunteer for Habitat for Humanity, or help medical brigades deliver care to rural areas of the world, participate in disaster relief, join an archaeological dig. Or, you know, just take a hike, with the proper equipment and planning. Anyway. Lost City of Z avoids this problem since a large chunk of the book traces Fawcett’s treks in the first quarter of the twentieth century, when great swaths of the Amazon were unexplored and when aerial surveys weren’t feasible. Fawcett made invaluable contributions to cartography, and though he was as ethnocentric as the next British explorer in those years, he avoided violence and showed respect for tribespeople. Yes, exploration is inherently violent in many respects, but this guy wasn’t out to conquer — he was out to make discoveries. And the discovery he most wanted to make was of ‘Z,’ the name Fawcett coined to describe a city of a hypothetical lost Amazon civilization, which he believed would have rivaled the Aztecs or the Inca in sophistication and scope. As Mr. Grann tries to understand Fawcett’s disappearance (the man was a legend, unbelievable skilled at survival and endowed with an almost miraculously sturdy constitution), he inserts himself into his own narrative, poking through dusty archives, visiting with Fawcett’s descendants, even trekking out to the Amazon himself. In a documentary film, this kind of move would be an automatic turn-off — seriously, even Werner Herzog barely gets away with it in Grizzly Man — but Mr. Grann is so relentlessly focused on his object of study that these self-insertions make sense. Fawcett is so hard to track down that he turns other people into explorers. Full of outsized personalities and interesting factoids, The Lost City of Z reads so smoothly that it felt novel-like. Highly recommended. Thank you for reviewing this book! It is one of my all time favorites, for the reasons you’ve listed. If you enjoyed this one, I recommend Jungleland, same general theme, this time in the Honduran jungle on the trail of another explorer. Thanks for the recommendation!! And Happy New Year! I also enjoyed reading The Lost City of Z. Good one! If you are interested in books of this type, i liked even more Candice Millar’s The River of Doubt, about Theodore Roosevelt’s journey up the Amazon. Thanks! I did notice a bunch of references to TR in Lost City of Z — I’ll add River of Doubt to my list! Enter your email address to follow Rosemary & Reading Glasses and receive notifications of new posts by email. I will never share your email with anyone. Pinky swear. Notre Dame from the window of Shakespeare & Co.
Why I Love Parks & Rec, or "O were my Love yon Lilack fair"
A Literary Wedding, or, "Earth's the right place for love: / I don't know where it's likely to go better." © Carolyn Oliver and Rosemary & Reading Glasses, 2013-17. Unauthorized use and/or duplication of this material (text and photos) without express and written permission from this blog’s author and/or owner is strictly prohibited. Brief excerpts and links may be used, provided that full and clear credit is given to Carolyn Oliver and Rosemary & Reading Glasses with appropriate and specific direction to the original content.